Stress is a normal part of everyday life, particularly when you're juggling numerous commitments at once. While stress is a healthy aspect of our daily lives and can often promote productivity, stress can be harmful and often debilitating, impacting severely on a person's life. It is important to be able to learn methods to help avoid or manage stress, but it is also important to be able to identify sources of stress in your life and how to minimise their effects. A lot of time people don't even realize that they're suffering from the effects of elevated stress levels. Although they may seem obvious, the most helpful ways to alleviate stress is to allocate enough time for rest, relaxation and exercise. Many of us lead busy lives, however it's vital for your mental, physical and emotional health to be able to integrate physical activity and movement into your routine. Reducing dietary stimulants is also a good starting point for eliminating stress from your life. Stimulants like caffeine and nicotine increase irritability as well as increase potential for emotional and physical exhaustion when their effects wear off and may impact negatively on your health. Think about the results you're searching for by using these substances and look for healthier alternatives. Grab a pen and some paper and list the pro's and con's of your situation. Even though it sounds ridiculous, it's a great way to be able to brainstorm your ideas and problem solve without becoming overwhelmed. It allows you to clarify your problem and choose an appropriate option to implement. Though this technique takes a long time to master, being able to consistently sit and be truly mindful of your body and your surroundings allows for time to listen to your body's needs. Often when we're stressed and busy, we overlook our own needs in order to get the job done. Taking time to be mindful allows you to recentre yourself and be fully aware of your body. If you happen to find yourself with two spare minutes, utilize this time. Correct your posture and attempt to clear your mind of any thought. Take care to notice your breath, how it feels when your chest expands or when the air passes through your nostrils. If you notice a thought, acknowledge it, without judgement and return your focus to your breath. It’s okay to find yourself distracted by thoughts, that’s how the mind works. The important part of this exercise is to be able to acknowledge the thoughts, without judgement and bring yourself and your focus back to your breath. Do this for as long as you like, whenever you can. Jon Kabat Zinn has written a range of books dedicated to mindfulness practice, with 'Mindfulness for Beginners' providing helpful tips for getting started and becoming comfortable with practising mindfulness in every day life. I also suggest doing some research in your local area to see if there's any restorative yoga classes available. These are great for taking an hour to let your body relax and refocus before getting back into your busy week. Once a week and I can promise you'll notice a difference in your attitudes to day to day occurances and your stress levels. Restorative yoga is a very low impact yoga class, which I often refer to as 'yoga nap time', passively opening the body to it's full extent and allowing you to reach your deepest level of relaxation. You can physically benefit from restorative yoga as well with the most notable effect being a decrease in your blood pressure. Seriously. Negative thinking often leads to catastrophising situations, which then leads to increased anxiety and stress. Negative thinking generally leads to decreased motivation to take positive action. When you're in a situation where you can only find faults, take a moment to regroup your thoughts and look at your position objectively. This allows room for rationalisation and lets you see things from a different perspective. It's really important to trust yourself and trust your body. You know yourself best, and if you're feeling as though you're becoming too overwhelmed remember it's okay to say 'no'. Try not to commit to more than you're physically and mentally able to cope with. It's also perfectly acceptable to seek professional assistance to develop your own strategies for managing stress and safely coping with stressful situations in your life. Speaking to your local GP is often a great starting point for accessing appropriate support services. 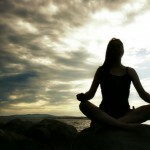 Serenity, Clarity, Bliss – Why Meditation is Beneficial to Your Health. Lucy Gilkison is a 19 year old nursing student living in Sydney, Australia. She aspires to work in pediatrics/adolescent mental health when she graduates. Spending most of her time reading or writing, she thrives on any opportunity to build on her ideas and opinions. Currently recovering from severe depression, bulimia nervosa and an anxiety disorder, she's passionate about raising awareness of mental health and reducing the stigma. Great tips. Stress can sneak up so easily. These are great ways to reduce it…I just need to actually put some of them into practice. Oh such great ideas! Been a tough year…..some of these ideas sound great. I do agree that positive thinking sure does play a big part! I am going to try practicing the Mindfulness! Sounds very relaxing! I do need to learn to say No. I always feel bad and just keeping taking on more things and get so overwhelmed. thanks for the great article…and tips!